While devices that run on different samplerates can 'live' on the same AoIP network, streaming audio between them has been a problem. Well, not anymore! 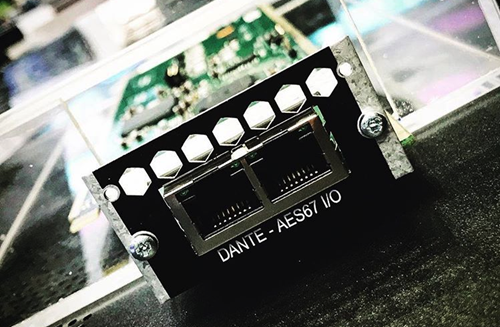 Production Expert has published a nice article on how our new Dante Expansion Card for AX32 is not solely about adding more audio channels to an Audinate Dante AoIP network - it can also solve some actual realworld production issues thanks to its onboard samplerate conversion. It is not a problem to have devices that run on different samplerates on the same IP Audio network, but you can't stream audio directly between them. Some have come up with various 'studio hacks' such as inserting analog outboard gear between the digital devices they want to use on the same network, but that unfortunately run on e.g. 48 kHz and 96 or 192 kHz respectively. This solution obviously means certain limitations in terms of the flexibility of the audio network - as well as potentially compromising the audio quality. There are several examples from the broadcast world. For example, the engineers in an OB van at a live event that is to be broadcasted may run on a different samplerate than the FOH console that feeds the audio to them. In this scenario, it is also common that both parties prefer to run on their own digital master clock, and once again, an AX32 with Dante cards installed will help making that possible. But there is also a great example from the music studio production sphere. And that is exactly what Production Expert delves into in their article. A quick to-the-point explanation is simply that more and more studios have installed personal headphone mixing systems such as the Allen & Heath ME-1, Aviom A320 or the classic Aviom A-16 and A-16 II. Common to all of these systems is that they run at a maximum samplerate of 48 kHz. 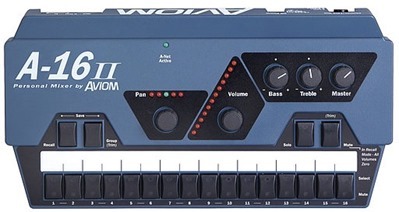 That in combination with the fact that so many studios run at 96 kHz or more makes an AX32 with Dante Expansion Cards a great solution and a real problem-solver. Well, you could just go back to traditional headphone monitoring, right? Sure, that would be an option, but there is a reason why such systems have become so popular: The musicians love the freedom and flexibility of being able to tailer their own personal headphone mix.